I always preferred Pooris over Kachoris until now. While buying vegetables for last week, I got Karonda (or crane berries) too. Upon seeing Karonda, the first thought was to make its sabzi like how mom-used to make at home. I called mom over phone and told her about the veggie and she was pleased to tell me the recipe on how she makes Karonda ki Sabzi. And then when she asked what will you make as the accompaniment, I plainly said paratha. She encouraged me to make Kachoris this time and have with Karonde ki sabzi. I followed her and the result was really really great. Moms know everything when it comes to food and recipes! And yes, she knows what will please my palate 🙂 I’m really glad I made these Kachoris with mom’s recipe and I’m excited to share the Kachori recipe with you too. A warning! You can get addicted to these tasty Kachoris. So if you are on a strict diet, pardon me 😀 I’m going to ruin it, may be for a day! Add all the mentioned ingredients and knead the dough. Cover with damp muslin cloth and keep it aside for an hour, to set. Divide the dough in equal small round balls. Roll each ball and flatten in round-shaped kachoris. Repeat for all the dough balls. Heat refined oil in a kadhai, for frying. Start frying the Kachoris, one at a time. Repeat for all. Serve with your favourite Sabzi. In the kneading bowl or plate, put three cups of wheat flour. Over it, add all the mentioned ingredients and start kneading the dough. Check out how to knead the dough here. The dough for Kachoris should be slightly hard. Once the wheat flour dough is kneaded, cover with damp muslin cloth. Keep aside for one hour. 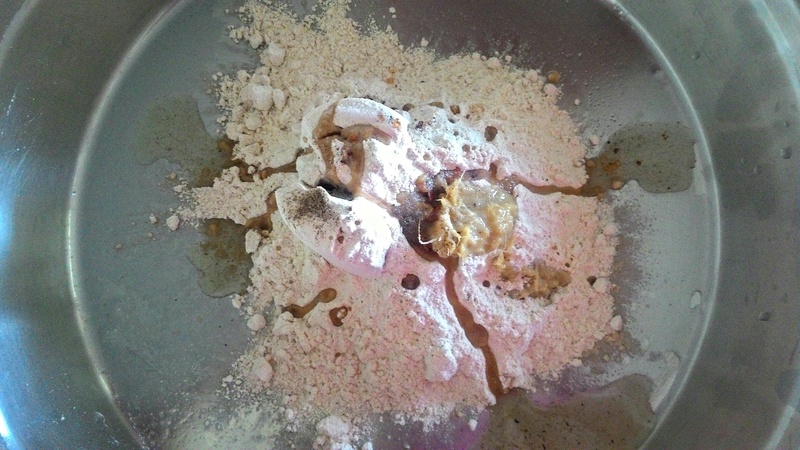 After an hour, divide the dough in equal small round balls. Roll each ball and flatten in round-shaped kachoris. It shouldn’t be too thin or too thick. Keep the raw Kachoris covered with a damp muslin cloth else layer of dry flour will accumulate over them and they may turn blackish. Repeat the process to make all Kachoris. In a deep pan or Kadhai add enough refined oil for frying. Heat it well. Now start deep frying the kachoris one by one. And serve it with your favourite veggie; it could be Aloo Amchur ki sabzi or Aloo Gobhi Sabzi. But when you make Karonda ki Sabzi, these Kachoris are must. When you slide one Kachori in hot oil, start pushing it towards bottom, with light hands. Flip after 10 seconds and repeat. Perfect! Remember, if the weather is pleasant at your place, keep the dough for 1 hour, else if it’s hot, just keep the dough to settle for 30 minutes only. Friends, if you make any of the recipes from Foodeez Junction, do not forget to tag us #foodeezjunction with your post on any of the social media profiles. We are everywhere – Facebook, Twitter and Instagram. To know what’s cooking at our home like or follow us there too. And please fill in the form below to help me serve you better.